The Hounds of East Fairhaven group is lucky enough to have the time and dedication of volunteers from several wonderful Greyhound adoption groups in the southeast. If you met a hound at festival and have decided that you want to learn more or if you want to adopt please feel free to contact any of our adoption groups. We are also always looking for committed volunteers who would enjoy sharing the history and love of our favorite hounds with patrons and future admirers. Feel free to contact us via our contact form and we would be more than happy to talk to you about joining our group! Volunteers are responsible for providing their own costuming but we'll be happy to help you figure out what you will need. 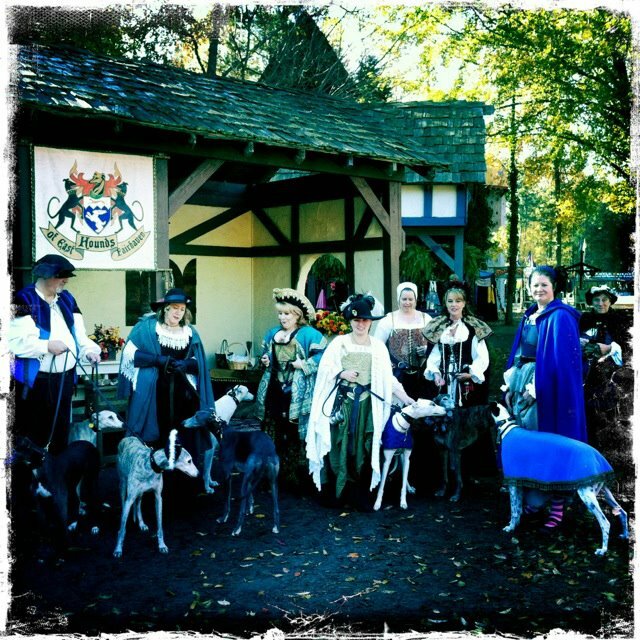 Renaissance-appropriate sighthounds are welcome but dogs must be fine with extremely large crowds, small children who may get on the ground with them, loud noises, long days, various animals, and a lot of activity and stress. Dogs must be kept under control on leash at all times; even when horses, geese, and other assorted animals are nearby. Bombproof dogs should do great! If you don't own a hound yet but want to volunteer some member will most likely have an extra hound for you to handle. Let us know ahead of time and we'll discuss your options. We do have a large majority of retired racing Greyhounds that come out to meet and greet. Please contact us and we will be more than happy to help determine if your hound will be a good fit for this unique environment and experience. If you have questions about costuming, acting the part, or about if your sighthound will be a good fit please feel free to contact us.